Pawhuska will continue to boast their rich history in Boy Scouting in May. The first American Boy Scout troop was established in Pawhuska in May 1909. Scout Executive Philip Wright said Pawhuska is an essential part of the Cherokee Area Council. He said the Cherokee Area Council – BSA will celebrate the 110th Anniversary of the first ever Boy Scout Troop next fall. To celebrate, the Cherokee Area Council will put on a camporee Sept. 26th through Sept. 28th. Neighboring councils will be invited to celebrate during the event. 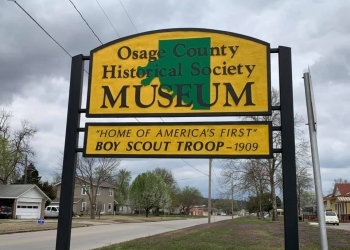 Wright also said Osage County Tourism will help coordinate the event. Wright said the September anniversary camporee celebration will be an amazing experience. He said the Cherokee Area Council will be in area schools before the camporee takes place. This is a great opportunity for younger scouts to hear and enjoy the history of scouting. Wright enthusiastically said scouts and their families from all over Oklahoma will be able to celebrate this gem in history. The September camporee will be held on the Camp McClintock Scouting Ranch off of Highway 60. Scouts will be able to pick up first aid skills, go through a compass course, go zip lining, compete in a dutch oven cooking contest and shoot 22's.